Collaborations between the art and fashion worlds have become de rigueur in recent years, but I was nevertheless surprised to read an email from the scrappy Portland imprint Publication Studio that announced its plan to have authors and artists "walk the Spring Line runway" at a book celebration last Thursday at the East Village bar Heathers to celebrate the company's newest publications. Murakami joyfully designing Vuitton bags is one thing, but asking writers to take to the catwalk sounded inhuman, a bizarre and disconcerting embrace of a fashion ritual. Thankfully, instead of seeing an exploitative spectacle, an audience of a few dozen people watched a bewildering art-book fashion show, with Publication Studio founder Matthew Stadler announcing brief synopses of the new books as each respective author (or a surrogate) walked along the length of the bar, brandishing the bound volume in his or her hand and showing it to the crowd. A baby, held in his mother's arms, carried proudly above his head a new art book by the fast-rising Ruby Sky Stiler. 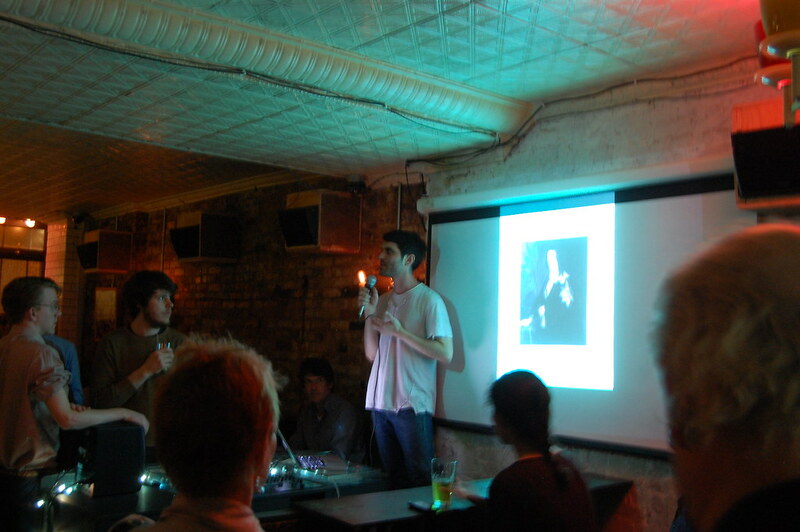 A young man held a blinking red light in front of Joseph Redwood-Martinez's event statements as he walked the improvised runway, showing the book, which was produced from, as Stadler put it, "utterly riveting [e-flux] emails." A photo-illustrated work of fiction by artist Colter Jacobsen and Berkeley Art Museum director (not to mention 2002 Whitney Biennial curator) Lawrence Rinder was paraded through, as was a photo book by Ari Marcopoulos. Matt Keegan discussed his book, A History of New York, which was inspired by Ric Burns's PBS documentary, New York. There would be no strutting for artist Matt Keegan, who instead took to the stage to present a slide show about his new 365-page tome A History of New York, which contains images that have culled from Ric Burns's documentary film New York and stripped of their identifying captions, left to viewers to identify. (Keegan currently has a — sort of — New York–themed show up at D'Amelio Terras, which sports a press release that includes an interview that he conducted with graphic designer Milton Glaser: well worth a read.) Publication Studio had been "a pleasure to work with," Keegan told the crowd. "They weren't concerned with image copyright." He then added quickly, "I hope I didn't just get anyone into trouble." Stadler returned to the stage. "The circulation of new material is the best response of artists and writers," he said, articulating his company's copyright ethos. He emphasized that he always aims to work "ethically and effectively," and that he asks that anyone who has an intellectual property claim with one of his company's books to notify him. Burns has apparently not yet made that call. 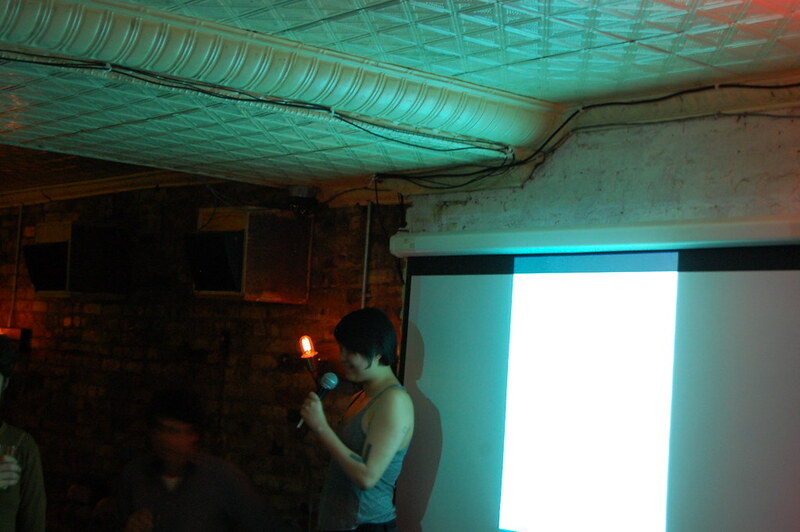 Christine Shan Shan Hou read an excerpt from her poetry book, Accumulations. There would be no such concerns for writer Christine Shan Shan Hou, who concluded the evening's festivities by reading aloud excerpts from her first book of poetry, Accumulations, which includes drawings by Hannah Rawe. People sat and stood quietly, as she spoke, closing with a new piece. It was the first and only time that it felt like a book reading was taking place.